You must be a member of the Mumbai Theater & Movie Lovers Group to attend this activity. Would you like to join this group? 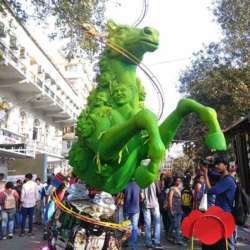 Kala Ghoda Arts Festival (KGAF), India’s biggest cultural street festival, is all set to deliver this year an enthralling commemoration of 20 years since its inception. KGAF Protected content celebrate 2 glorious decades of art and culture across various forms and communities including design, cinema, Theater, Dance, Literature and much more. This year also marks Protected content of Mahatma Gandhi's Birth and the festival pay its respect to his philosophy and contribution to the nation as well. The festival has movies, music, art, heritage walks, theater, literature, in short everything for everybody and its open to all, free of charge. you can also check above link for more information.